Posted on May 28, 2013 by Tom | Comments Off on Bee Venom Destroys HIV! An ancient Chinese medicine protocol known as “apitherapy” appears to be making a resurgence in modern times, as scientists continue to uncover the many amazing healing powers of bees and the substances they produce. And a new study recently published in the journal Antiviral Therapy affirms this, having found that bee venom, which is released during a bee sting, may hold the key to targeting and destroying HIV. As reported by U.S. News & World Report, scientists from the Washington University (WU) School of Medicine in St. Louis, Missouri, identified the presence of a compound known as melittin that they say exhibits powerful anti-HIV effects. The bee venom toxin was visibly observed to destroy the viral components of HIV while leaving healthy cells unharmed. For their research, Joshua Hood and his colleagues from WU attached melittin to nanoparticles that are smaller than HIV. They then applied the resulting substance to HIV itself, where it was clearly observed to “rip holes” in the outer layer of the virus, effectively destroying it. But because of the particles’ size, they did not harm healthy cells in the body. According to ScienceNews.org, the team also applied the solution to healthy human cells obtained from vaginal walls. 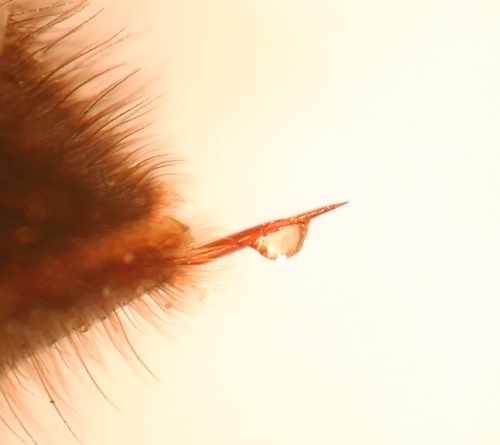 They observed that the substance did not visibly affect these healthy cells at all, illustrating the unique nature of the bee venom in differentiating between the cells it is supposed to attack, and the cells it is supposed to leave unharmed. As far as HIV potentially growing resistance to the treatment later on down the road, researchers believe such a scenario will never materialize due to the nature of the mechanistic action. Because bee venom specifically destroys the outer layer of the virus, which results in the virus itself dying, there is little or no chance of resistance ever developing. However, the use of nanoparticles, which have never been proven safe, is not actually necessary for bee venom to do its work. A patent issued to Vespa Laboratories, Inc. back in 1989 reveals that the use of melittin as a natural antiretroviral treatment was known long before nanoparticles were even invented (or discovered), which means the substance itself, without modification, possesses anti-HIV properties. And besides bee venom, many other bee products may also target HIV naturally without the need for deadly antiretroviral drugs and therapies. Numerous scientific studies have shown that bee propolis, for instance, is loaded with biologically-active substances that stimulate immunity and prevent HIV replication. And royal jelly, which is considered by many to be a “perfect food,” contains all sorts of beneficial hormones, vitamins, and other nutrients that naturally promote strong immunity and the proliferation of healthy cells. Comments Off on Bee Venom Destroys HIV! Leicestershire AIDS Support Services has won a prestigious GlaxoSmithKline IMPACT Award for its outstanding contribution to improving health in Leicestershire, GSK and The King’s Fund announced last night at the award ceremony held at London’s Science Museum. LASS provides rapid HIV testing, support, information and advocacy to people affected by HIV and AIDS in one of the most diverse areas in England. Leicester has many different communities and an above average population of HIV positive people. To slow down the spread of HIV and help people to access treatment, LASS invests in rapid testing services in community settings. There is particularly low uptake in some African communities, so LASS trains volunteers from these communities to carry out testing and provide information. They provide testing at a range of events and venues including African football tournaments to reach people who otherwise wouldn’t be tested. LASS also provides services for people with the virus and maybe coping with other issues like poor mental health, and they provide healthy living training. The GSK IMPACT Awards, GSK’s flagship UK corporate responsibility programme organised in partnershop with The King’s Fund, is seen as a ‘seal of excellence’ in the sector. As well as as receiving £30,000 in funding during a difficult financial climate, the winners can take part in a training programme hosted by The King’s Fund that provides training, development and networking opportunities. Feedback has shown that this opportunity is as important to the winning charities as the funding as it helps them develop the skills to carry on building their organisation. We are absolutely delighted to be recognised at this high level for the impact of our local work supporting and empowering people living with HIV, and challenging and breaking down stigma and discrimination. Our community HIV testing programme is contributing to government public health targets and has already saved the health service more than £3million through encouraging more people to have an HIV test and know their HIV status. This huge achievement for Leicester, Leicestershire and Rutland is due to the continued commitment by a great team of staff and volunteers. They are determined to deliver the highest standard of services possible and make a significant diference in HIV provision locally with a relatively small budget. This award will make a significant difference to the profile of our work and the reputation of LASS and our new social enterprise. The calibre of award is reflected in its judging panel who chose the winners, which this year includes Professor Steve Field, Deputy National Medical Director at NHS England (health inequalities); the journalist, Fiona Philips; Peter Wanless, CEO of The Big Lottery; Gilly Green, Head of UK Grants at Comic Relief; Sir Christopher Gent, Chairman of GSK; and, Sir Chris Kelly, Chair of The King’s Fund. Please note that case studies and spokespeople are available for interview, along with photographs. For further information or interviews, please contact Saskia Kendall at The King’s Fund press office on 020 7307 2603 or by email on s.kendall@kingsfund.org.uk.